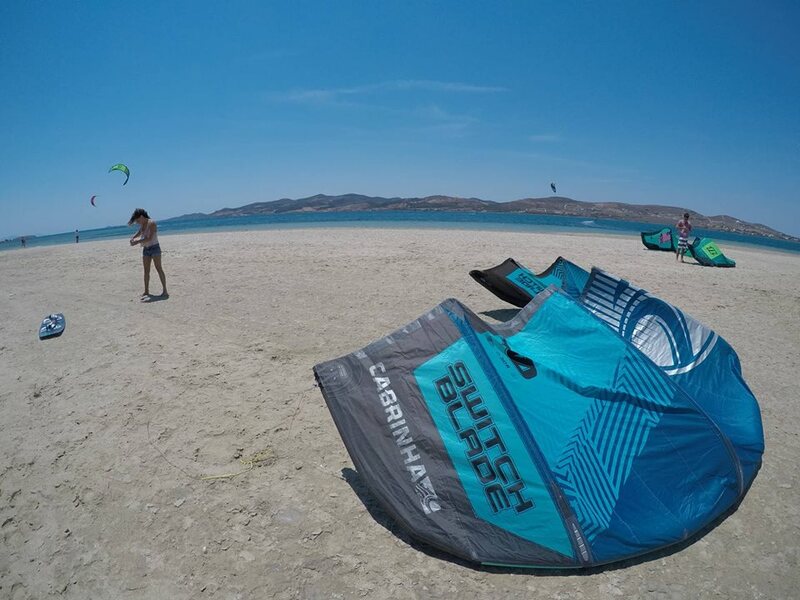 The Island of Paros has been growing in popularity over the years as more kitesurfers and windsurfers learn about the amazing wind conditions over July and August. With its authentic Greek cuisine, lively community and warm weather, there are very few reasons not to go! Athens Airport is the main airport for international flights arriving from all over the world and a connecting flight to Paros is easy to find. Otherwise, a taxi to the port of Piraeus; which is about an hour’s drive away, and a ferry across (3-4 hours) is the most common way to get to most islands in Greece. The high season for kitesurfing on the island is a short one, only about 8 weeks, but it is said that the “Meltemi” wind blows from mid-May to mid-September. Meltemi is a wind that blows strong and dry from the North in the Aegean Sea and other parts of the Mediterranean Sea. This helps to cool down the usually hot and humid Greek Islands, making summer much more bearable. Known to pick up and gain strength in the afternoons, Meltemi wind usually blows up to 20 knots and more. Paros is a small island and it is easy to get around. The most popular forms of transport are by car, scooter or small boat taxis. There are buses that run on a frequent schedule and take passengers all around the island, and the price range anywhere between €1.50 to €3. There are rental cars, scooters and quad bikes on the island, but during high season it can be a nightmare to find parking near your accommodation! Greek cuisine is fresh and delicious, and Paros has an abundance of traditional Greek restaurants that offer everything from Spanakopita to Greek Salads and freshly caught fish. Wash that down with a local Ouzo, Mastika or one of the many beers or wines they produce in the country. Aside from Greek food, there are plenty of other restaurants serving Italian, Asian, Middle-Eastern cuisine and more. Feeling slightly peckish? Grab a beer at a small cafe or bar around 5-6pm and most places serve you some local finger food - Tzatziki, Fava dip, olives, or stuffed grape leaves. Paros and its neighboring island, Antiparos, are both known for their liveliness and party vibe as soon as the sun sets. With a plethora of vibrant nightclubs and bars to choose from to go drinking, dancing, to live music and beach parties. Paros has many no wind activities on offer. Rent a boat, go for a hike, explore the island by foot, bicycle or motorbike. You can also go sailing or lounge on one of the island’s many beaches. Paros also has its own vineyards that provide wine tastings. The towns of Parikia and Naoussa are known for their shopping areas; a network of labyrinths to get lost in, find small boutique shops or simply admire the classic Greek architecture. There is wifi everywhere you go on the island, in almost every cafe, restaurant, and bar. You can also get a Greek sim card with data starting from €10. Paros has several small towns, the two most popular for holidaymakers being Parikia and Naoussa. There are many boutique hotels and bread and breakfasts to choose from. These days, Airbnb is one of the best and cheapest platforms to find accommodation on, offering anything from a shared apartment to studios to whole villas. Mia Ayoub is from New Zealand/Egypt and is the founder of Kite Tribe, a freelancing school that offers private and group training as well as women’s camps on the Red Sea in El Gouna. Been to Paros? What did you think? Where are the Best Kitesurfing Beaches in Paros? Pounta is the main area for kitesurfing on Paros, and there are two kite schools in the area; Paros Kite and Paros Kite Pro Center. Paros Kite Pro Center is the slightly smaller of the two and is a few hundred meters downwind from the other. The beach is sandy, and the spot has flat water and is shallow of the first 5-10 meters before becoming quite deep. When the wind gets stronger, it can be a bit choppy, but still relatively flat in the area. The wind is side-shore or side onshore, mainly blowing from the north-northwest. The school provides a rescue service on a daily or weekly fee. Peak season can get extremely busy, but there is always space if you’re an advanced, independent rider. The school there is pretty basic, but the team is friendly, and they offer good food and cold beers on site! The other centre is called Paros Kite. Both schools/centres are on the same spot, so share the same conditions and have similar offerings for students and independent kiters. Check out both and go with the one whose vibes you prefer! When is the Best Time to go Kitesurfing in Paros?